All photos provided on our website are of the "actual item" being offered. Beware and avoid dealers who use any "representative photos" of their merchandise! Photo security feature www.Beatles4me.com does not appear on the actual item. Used in the 1960's during the card manufacturing process, Printer's Proof Sheets allowed Quality Control to accurately calibrate the Printer's Register Marks on the "negatives" and properly assess the print-quality of the product prior to the official run. Typical concerns were photo clarity, ink contrast and printing machine quality, just to name a few. If either the Printer's Register Marks were out of alignment (causing a "blurry" photo), inks were low or "dry" (causing fading or uneven ink distribution), or the printing machine was dirty (causing random "spotting" in the photos or even worse, "jamming"), the problem(s) would be realized after passing many "test sheets" (also known as Printer's Proofs) through the machine before preparing it to produce 1000's upon 1000's of large sheets of cards ready to be cut into individual cards. These Uncut Card Printer's PROOF SHEETS are Incredibly Rare and Nearly Impossible to find!!! This process had to be performed on EACH MACHINE being used EVERY TIME a new card (baseball, football, Beatles, Monkees, etc.) was to be manufactured on a massive scale for the entire country. Testing each machine in this fashion would definitely result in much wasted paper in order to guarantee an end-result "quality" product. In an effort to keep costs down, only Single-Sided gray-back cardstock sheets were used during this calibration process. If these "test-runs" were omitted during the card manufacturing phase, the chances of producing horribly flawed product would almost be certain, resulting in numerous consumer complaints and returned merchandise. Topps Inc. and their affiliates were not about to take such chances and possibly ruin their reputation. Therefore, the need to print "Printer's Proof Sheets" was essential. Once the Printer's Proof Card Sheets passed Quality Control measures, the more expensive Double-Sided large cardstock paper was inserted into the machines for the Final Production Run, producing ONLY the "photo side" of the cards (Final-Run Phase 1), which were later fed into another machine to print up the backs of the cards (Final-Run Phase 2). "Tens of thousands" of Uncut Card Sheets for all types of cards found over the years with the "card backs printed" are the result of Test Runs of "Final-Run Phase 2", and are relatively "very common". However, very "FEW" Printer's Proof Sheets have ever surfaced and survived all these years! They are simply ULTRA-RARE!!! Personally obtained from the Estate of a Topps Inc. affiliate Art Department Production Executive. The Production Executive began working for baseball card manufacturer back in the mid-1950's up through the entire 1960's in North America. Long retired, he passed away in 1986. His son, from whom we purchased this Beatles item directly, lived with his elderly mother in his parent's home until recently, when his mother passed away. It was then, during the packing of his parents belongings in order to sell the home, that a small group of these Beatles "A Hard Day's Night" Printer's PROOF Sheets were discovered. They were neatly stored in large plastic bags among many Baseball Card Printer's Proof sheets that were also discovered packed away in their attic for over 40 years! 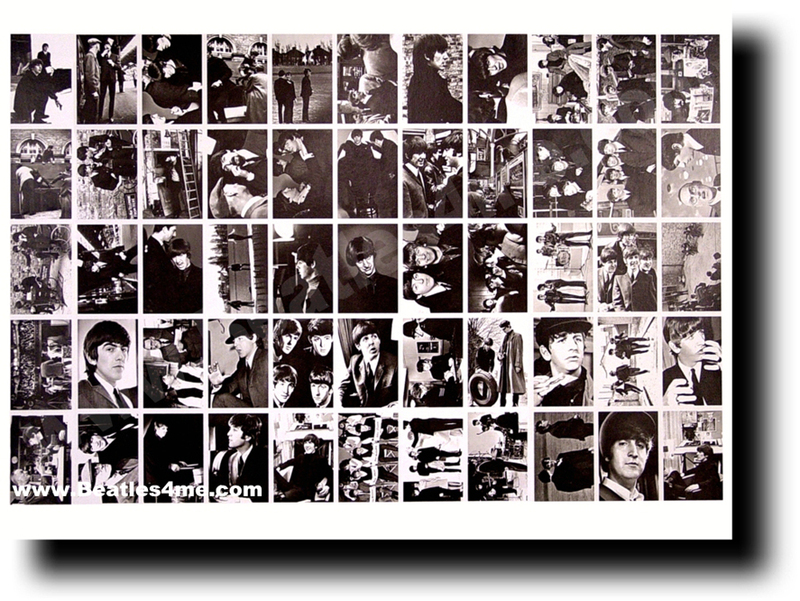 We were fortunate enough to have acquired a small group of these Beatles "A Hard Day's Night" ULTRA-RARE UNCUT Printer's PROOF Sheets! To receive our "Extensive" Beatles Catalog (Hardcopy), featuring 100's of Original Beatles Records & Memorabilia items yet to be posted here, send $10.00 to our address provided at the bottom of this page...OR ""Click here"" to view our "FREE Beatles Records, Memorabilia, Autographs & Collectibles"!!! This list of ~800+ Beatles items on this link represents only 1/25th of our vast inventory! Please NOTE: Appraisals on your items are only given for a "fee". Contact us for payment details. Thank You.